Head of Land of Israel Lobby convinced proposal to impose sovereignty over Judea and Samaria will win majority in party Central Committee. The Likud Central Committee will convene this evening for a special meeting in which a vote will be held on the principle of applying Israeli sovereignty over Judea and Samaria. In preparation for the event, Arutz Sheva spoke with the Chairman of the Land of Israel Lobby, MK Yoav Kish, a member of the Likud party. MK Kish believes that at the end of the debate and vote "there will be a very clear statement that the time has come for Israel to lead an independent move to impose sovereignty in Judea and Samaria. "I believe in the autonomy plan that grants sovereignty over Jewish settlement in Judea and Samaria and creates autonomy for areas administered by the PA," he says. 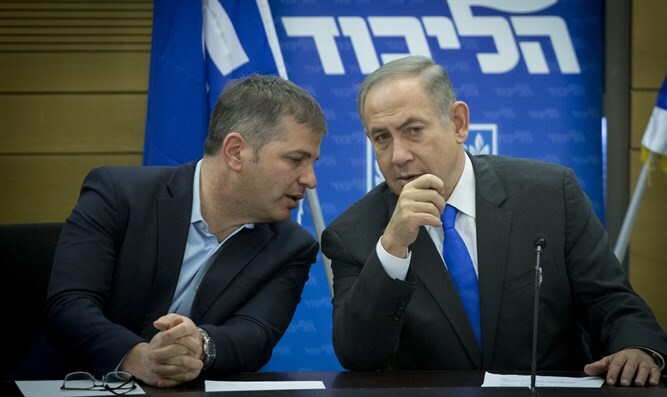 "I believe that this is a move that will win a large majority in the Likud Central Committee." Kish notes that this coming Wednesday the Knesset is expected to present its proposal that any law enacted by the Knesset will be applied immediately to the communities in Judea and Samaria and will not be subject to deliberation and decision of the OC Central Command. "This reality where such laws fall through the cracks needs to stop." Prior to the discussion, Kish will hold a joint meeting with ministers Shaked and Levin. Kish was asked whether today's proposal relates to the entire area of Judea and Samaria or to Jewish communities only. Kish said he did not know the precise text, and therefore could not answer the question comprehensively, "but I think the move will win a large majority, certainly as concerns Jewish settlement. Regarding the entire area I don't think there's a majority in the Likud Central Committee to impose sovereignty over Ramallah and Shechem. I don't think it's time for that." Kish says that within the Likud there are also voices opposed to the proposal who fear it will compromise the Prime Minister's political maneuvering ability. There are also those who believe this is not the time to advance the idea, or that such a move should take American considerations and coordination with the administration into account. In Kish's opinion, these positions will not determine the vote, and they themselves know that they are in the minority in the party Central Committee. For his part, Kish believes that "the truth must be told, and just as Trump knew how to tell the truth about Jerusalem, we have to tell the truth about what must happen in Judea and Samaria." Regarding coordination with the US administration, Kish was asked if there was dialogue between the proposal's Likud sponsors and the administration prior to its submission for discussion and vote. Kish replied that although he is not aware of any focused coordination on this issue, "there is constant and continuous dialogue between the Prime Minister's Office and the American administration on many relevant issues, in everything related to construction, building plans, and political moves." MK Kish was asked whether the vote would have a practical ramification, and he replied: "The Likud Central Committee is a body that concentrates the party's powers and its ideology, and such a statement by the Likud Central Committee is of great importance to anyone who thinks he wants to lead a different path." On the Prime Minister's unstated position on the matter, MK Kish was reminded that Netanyahu objected in 2012 to a similar proposal made by then MK Miri Regev. Kish says to ask Netanyahu himself. "I didn't ask him and I have no idea," he says, and when asked whether it does not concern Central Committee members that they are promoting a proposal that contradicts the Chairman's position, he replied that "if the Prime Minister were opposed he would have expressed it though his channels. I don't think his position is against. Far from it. The Likud is a democratic party and there's great importance to what the members of the Center and the rank-and-file members think. We grant freedom of action in the matter and not everything that comes up conforms to what each senior party official thinks. It's clear the party head's position has special status, but the fact that we're conducting the discussion, and that every discussion must be approved by the Chairman of the Central Committee and by the Movement Chairman, shows we're not in conflict." Kish adds that in his opinion it is politically impossible to oppose such a proposal. "I don't think it's possible to oppose it. If the Prime Minister has any reason to oppose, its tactical vis-à-vis external elements and doesn't stem from ideological opposition. As for the specific tactic, you have to ask him," he said.